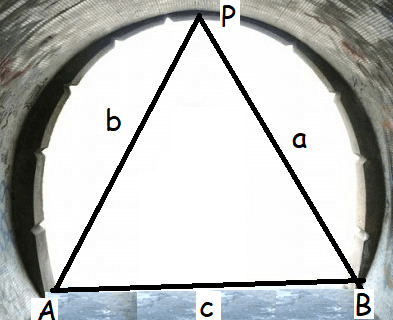 About "Word Problems Using Law of Sines and Cosines"
A researcher wants to determine the width of a pond from east to west, which cannot be done by actual measurement. 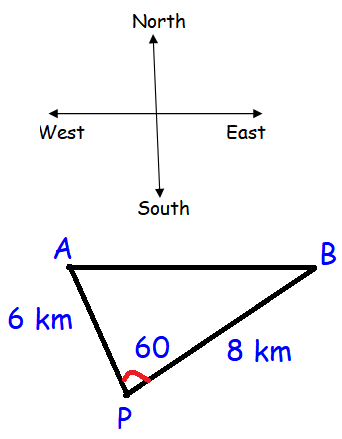 From a point P, he finds the distance to the eastern-most point of the pond to be 8 km, while the distance to the western most point from P to be 6 km. If the angle between the two lines of sight is 60°, find the width of the pond. By finding the missing side, we may find the width of pond. Hence the width of pond is 2 √13 km. Two Navy helicopters A and B are flying over the Bay of Bengal at same altitude from the sea level to search a missing boat. Pilots of both the helicopters sight the boat at the same time while they are apart 10 km from each other. 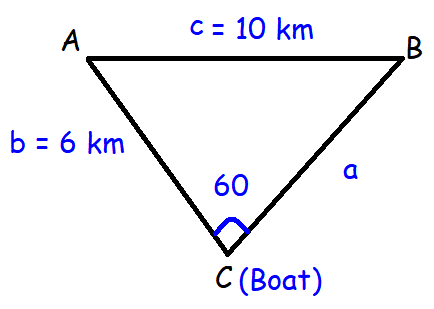 If the distance of the boat from A is 6 km and if the line segment AB subtends 60° at the boat, find the distance of the boat from B. To find the missing side, we have to use the cosine formula. Here we use the formula for cos C, because we know the length of b and c.
Hence the distance from the helicopter B to boat is 3 + √73 km. After having gone through the stuff given above, we hope that the students would have understood, "Word Problems Using Law of Sines and Cosines"
Apart from the stuff given in "Word Problems Using Law of Sines and Cosines", if you need any other stuff in math, please use our google custom search here.